Hello, my name is Veronica. I have been a receptionist with OCVMC since 2012. I love seeing and interacting with all pet parents and their furry babies. I have been in the veterinary field since 2005. I have a Papillion named Leila with supermodel good looks. 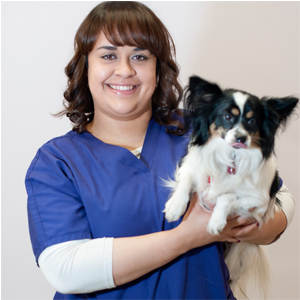 I have been an animal lover all my life and I love the close family atmosphere that we have here at OCVMC. I dislike anything pumpkin and I absolutely love coffee.